A little while ago, I was sitting on a bus, considering the invisible infrastructure of cyborgs (like you do). Meaning, all of the things that needs to be happening behind the scenes or have happened in the past to allow the independence of the self-sufficient super-being. While this was happening, we got stuck in traffic behind a delivery truck. We were surrounded by them, in fact, and it occurred to me that I was on one (Greyhound offers a courier service). I started thinking about the insane infrastructure required to have something like FedEx. The need to rapidly get something from one place to another. 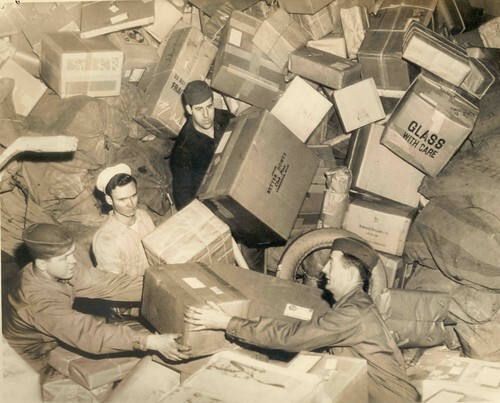 The network of planes, warehouses, barcodes, computers, scanners, trucks, garages, boxes, and people all bent to the service of moving things around on our behalf. FedEx’s business is in serious jeopardy. I wonder if they realize this. It begins with letters, of course. FedEx is in essence a finely tuned premium mail carrier. That email put a huge dent in regular mail is old news. It’s faster and freer. When it comes to the transmission of information – one of the main uses of mail carriers – the Internet wins in almost every situation. This doesn’t really matter to FedEx. They were never in the regular mail business. They ARE in the authenticity business and the object business, however. Both of these are under threat. This is how contracts between far flung business partners get negotiated: You have a few calls to outline the deal and then someone draws up a draft contract in Word. This gets emailed out with track-changes turned on and then it goes back and forth electronically until a final version is agreed upon. This is promptly printed off, signed and faxed with the originals to follow by Fed Ex. I have no idea why we still have to send the “originals” by physical mail. A nod to tradition I suppose. There is nothing about a laser-printed 30 page document with signatures on the last page that’s particularly more safe from tampering than an properly secured electronic copy of the same. If eBay, Amazon, Paypal and my bank can solve the authentication problem, it can be solved for contracts. For whatever reason, the business/legal world insists that it needs a copy of a sheet of paper with ink from a pen that I actually touched. So it gets sent by FedEx and the guy shows up at your door with the package and to prove it was received, you sign for it. On a touch pad. Electronically. I don’t think that the signed documents portion of FedEx’s business is long for this world. Once the Authenticated Document portion of FedEx’s business fades away, they’ll have to retreat into the molecule moving business. Here’s a need that, at least for the immediate future, doesn’t get demolished by the Internet. At some point, rapid prototyping and 3d printing becomes a mature technology. It leaves the design studios and then the factories and ends up, if not people’s houses, then at least as commonly distributed as print shops or 24hr photo developers (which are themselves getting to be less and less common). Just-in-time fabbing. So many of the things that we ship are mass-produced and interchangeable. Take a look around you and consider all the stuff you might move, were you planning to move. How much of it is stuff where an exact copy would be fine? How much of it is stuff where a factory-new copy would better than fine? How much crap do you ship because it’s easier/cheaper to just ship it than to get a new or better one? It’s not everything. Objects with acute sentimental value, hand crafted trinkets, mementoes, these will all be things you want to keep. But even this category is smaller than you might think. It’s not that long ago that photos were on the “must ship” list. Now they’re digital and easily reprintable, if they’re ever printed at all. With mature 3d printing we’ve ended up with a kind of teleportation. This is the kind of thing that gives philosophers of art nightmares. Need a computer at your destination? We’ll fab you one and format it from your encrypted cloud-image. It’ll be ready at the airport with your rental car and a change of clothes, which we also printed to your specifications. Need your bike shipped? Drop it off at a reclamation facility, we’ll scan it and credit you the materials, then for less than the price of flying it across the country, we’ll rebuild it over there. For a small fee, you can fiddle with the specs. You want to ship books? Really? Who ships books? Because of mass-production, we’ve been living among essentially interchangeable copies for quite some time. The next step is making them utterly interchangeable. Here’s my prediction: We are less than 50 years away from the shipping of objects being as quaint and specialized a practice as shipping sheets of paper with good-wishes written on them.